I will miss Bells, but I'm glad you had time to make him comfortable and say goodbye. Our lapine friends are so fragile, and loss is the price of the joy they bring us. It takes great courage to open up again and again to these little heartbreakers. Binky free in green meadows, Bells. I'm all teary about Bells, but also happy-teary that Nuage has a new friend already. Sending you all love and binkies. oh so sorry to hear about bells. Happy that Nuage has a new friend! Oh that is sad.Bells was a beauty,and he had the most wonderful life with you,hubby and Nuage,I'm glad you decided to get a new friend for Nuage,and we can't wait to meet her. until we see you again Bells have a blast over the bridge! With great joy often comes great sorrow - I'm sorry about Bells, but he had a wonderful life with you and Nuage. I'm glad that Nuage has found a lively and fun friend. I'm so sorry Patricia...but so glad you were able to spend his remaining time loving and snuggling him rather than big invasive scary things that wouldn't have worked. It's a brave brave heart-searing set of decisions you made and you did it for him and that makes you a hero. Much love. Again you have dome the right thing in all possible ways. Lots of love to everyone and everybun. Can't wait to see Nuagey's new companion. O.M.G. So very sorry to hear about Bells--and so very sad and happy for Nuage that he has lost one companion and found another. Mr. Mick and I send everyone and everybun of you hugs, much love, nose bonks and bunneh kisses--and we'll be sending many special thoughts out to dear Bells as well. (Edited to correct typo) Oh Bells, I can't believe you are gone and Nuage is now with another! Thank God for that though, Bells, because he and your wonderful mom need some help dealing with your unbelievable departure. Thanks for giving your family the time you gave them so they did not have a sudden, fleeting goodbye. Thank you. And dear Nuage and P., thank you for being so brave in letting Bells' public know about how he has left the boat. Nuage and Tolly, run fast and binky hard! And 'Alice', I'm hoping that an old Native American proverb may help you treasure your years - "the soul would have no rainbow if the eye had no tears." Ohhh, will miss Bells as I still do Fats! My heart goes out to you for your and Nuage's loss of beloved Bells, who had a beautiful life with all of you. Having loved and lost 5, know how wrenching it is to say goodbye. Agree with everything Ann said! Wishing you, Nuage and Tolly many happy and healthy years together. You've been on my mind. I was away traveling for work. I'm glad you came to a happy decision. Looking forward to meeting Waaugie's new buddy. 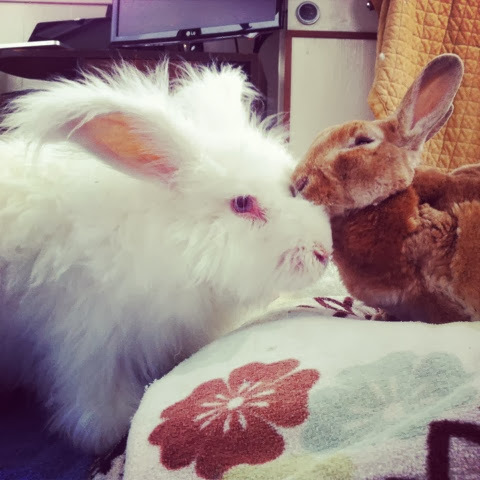 Rest in peace sweet bunny, never enough time with them, but that was a bunny that won the bunny lottery and was loved greatly. Can't wait to see the new friend, and glad they get along! Oh noes! I'm so sorry for your lost. Bells was a beautiful bun. I'm glad he was able to share his life with you and Nuage for as long as he did. I will miss him too. i'm only just seeing this... so very sorry for your loss, and for the great Bells' departure. I think he was one of the world's best buns. At the same time, I'm so happy that Tolly is with you guys and putting Nuage through his paces. I know that nobody can ever replace Fats and Bells, but here's hoping that Tolly brings much unlooked-for joy into your lives.